Spain is good at two things: Partying and football (soccer). And both came in to play as soon as I stepped off the plane from my trip to Brussels. Upon my arrival to Madrid from Brussels, I barely even got a moment to breathe. I went straight to my flat to drop off my bag and then I went directly to the Bernabéu Stadium (where Real Madrid plays). 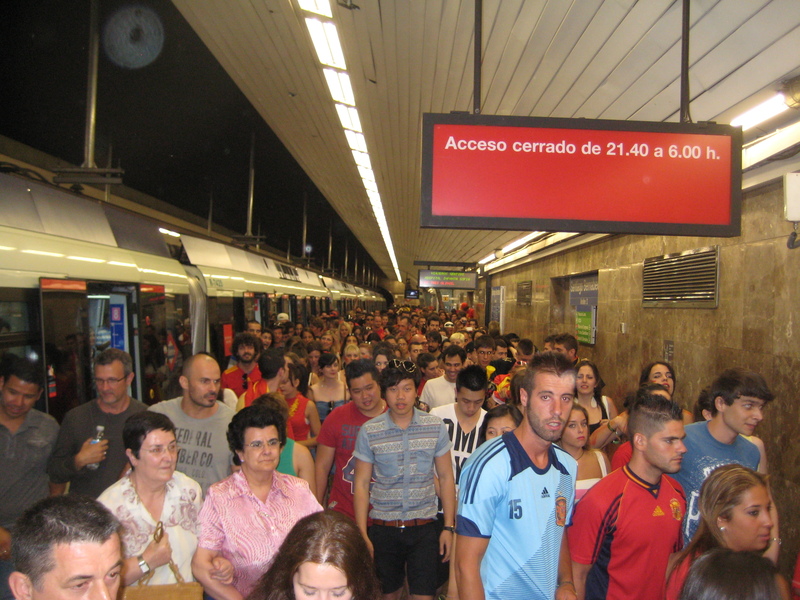 As I was entering the Metro, you could already see all the people painted red and gold: It was the EuroCup championship and Spain was in the finals. People were screaming, blowing horns, and of course wearing flags, jerseys and t-shirts all decorated in the colors of the Spanish flag. I finally got to the stadium that was jam-packed with people cheering. I was trying to meet up with Angel, but I’d have to wait until half-time to find him because there were just too many people. They set up three enormous television screens where viewers could watch the match. I’d like to say I was a bit torn as to who I was going to root for because I have so many friends from both countries. But the choice was pretty clear. It had to be Spain, despite all the groans and complaints from my Italian friends. 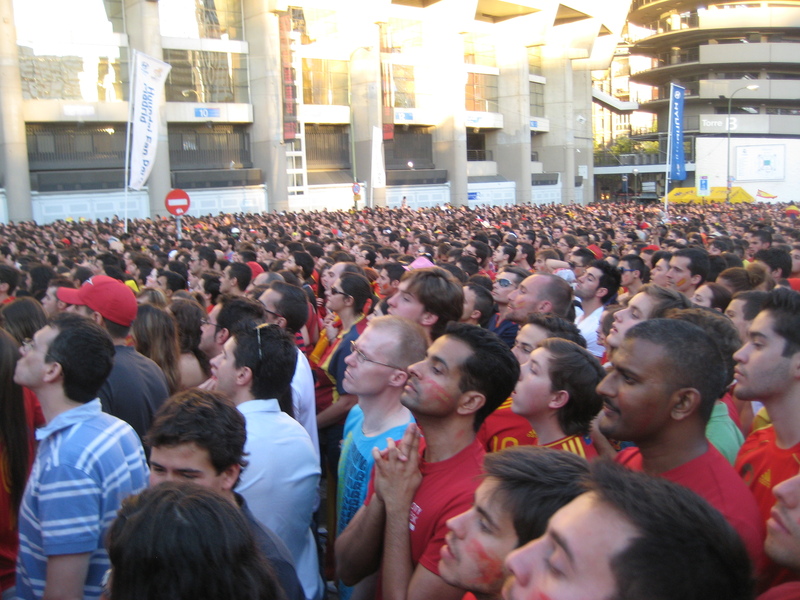 Within just a few minutes of me arriving at Bernabeu, Spain scored its first goal. The crowd went berserk: People jumping, screaming, blowing horns and whistles, climbing each other, complete and utter chaos. We’d see this madness repeat three more times. The environment was incredible; you could smell the excitement of victory in the air. Not even the stench of beer and tinto de verano spilling on the streets could over-empower the emotion that flooded the air. 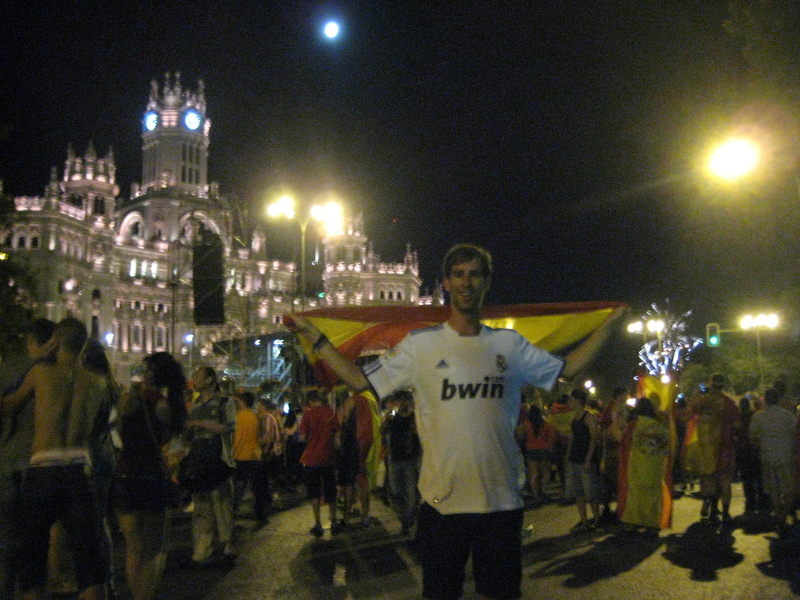 When the match ended, with Italy in silence, and Spain in what seemed like revolution, the people took to the streets. We marched with them as cars flew by honking their horns, people screaming, and police trying to maintain control but there was no hope. The fans stopped every car to yell their excitement at its driver, bus windows were broken in the frenzy of excitement, and of course more and more alcohol was drunk. Everyone was heading in the same direction: Cibeles, the main glorieta in Madrid, right in front of the town hall. There we found a chaotic stampede of people drinking and screaming. Even the police were relaxing and enjoying the victory of their country. Seeing the joy turned chaos in Spain, I can’t even imagine how Spain must have been when the Franco regime collapsed: Every street was chalk-full of people, no one was left indoors, everyone came out to celebrate their success. It was like war; the noise could silence a bombing. 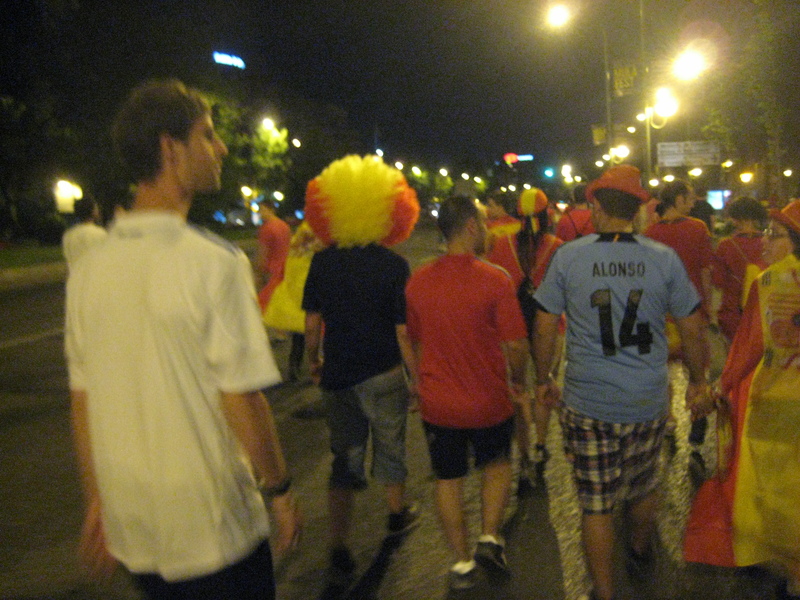 I flew home Sunday morning from Brussels just to see the party when Spain won and that’s what I got. It’s too bad I was still so exhausted from the long weekend away that I ended up retreating home around two in the morning. But even that was difficult as I had to dodge all of the people running down the streets and sidewalks. Eventually I made it home, safe, sound. And as the entire country erupted in mass-fiesta, I finally fell asleep dreaming about how no one would give a darn if the United States ever won anything soccer related.